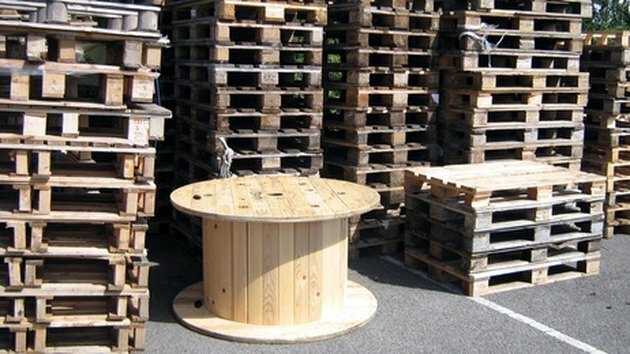 Wood pallets are an extremely economical and versatile building material. By re-using old wood pallets to make your own animal shelter, you will save money and time. Wood pallets are often available for free from lumber yards or hardware stores, and they offer a ready-made modular building unit for construction of your animal shelter. With the right preparation, you can easily build a watertight animal shelter from wood pallets and other scrap materials in a single afternoon. Use wood pallets to build your own animal shelter. Lay a wood pallet flat on the ground. Prop two additional wood pallets upright on top of the platform pallet and ask a friend to hold them in place. The two upright wood pallets should lean against each other to create an A-frame structure on top of the platform pallet. Secure the upright A-frame pallets together with L-brackets and galvanized screws. Attach the base of the A-frame to the pallet platform with additional L-brackets. Hold a piece of scrap plywood against one open end of the shelter and trace the triangular outline of the shelter onto the plywood. Cut out the triangle with a circular saw. Screw the triangular plywood wall to the back of the pallet A-frame. Cut a smaller triangle from scrap plywood for the front of the structure, allowing for plenty of clearance below the triangle for easy entry and exit. Screw the smaller triangle to the front of the pallet A-frame. Staple a waterproof tarp to the exterior of the shelter, wrapping the tarp tightly around the shelter to prevent water accumulation. Place a carpet scrap or an old quilt on the floor of the shelter.